STS-3 was the third space shuttle mission. Although the permit has “Feb” written on it, the actual launch day was March 22, 1982. 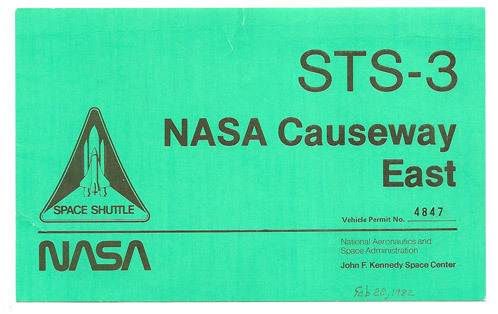 This permit allowed the vehicle and all its passengers to enter the viewing area to watch the shuttle Columbia lift-off from Kennedy Space Center. The front is a bright florescent green, while the back is a plain white with a basic maps to the location, plus instructions. A few points of historical interest about STS-3, it was the first and only shuttle flight to land at White Sands Missile Range (due to excessive flooded at Edwards Air Force Base, the original landing site). The flight was dedicate by then president Ronald Reagan “to the people of Afghanistan”. As of this posting there have been 127 shuttle launches with another 7 planned launches through 2010, after which the shuttle program will go into mandatory retirement. It is to be succeeded by Project Constellation. A 17 minute video of the STS-3 mission, narrated by the astronauts can be found on the National Space Society’s website here.